Between the 12th and 14th centuries the monks of Paisley were given various chapters to net for salmon in the River Clyde. In 1424 representatives of the Burghs of Renfrew and Old Kilpatrick met to discuss their conflicting rights to certain Salmon Fishing’s. They were even arguing about Salmon back then. The 1700s saw a massive increase in the population along the banks of the River Clyde and some of her tributaries such as the Kelvin, the White Cart and Black Cart. By now sewers were discharging directly into these rivers as you can imagine the water quality began to diminish. A weir was constructed at Blantyre in 1785 to help power the mill at that location, a fish pass was also installed which allowed the diminishing numbers of Salmon and sea trout to reach their spawning grounds in rivers such as the Avon and Nethan. The height of the weir was increased in 1850 but no provision was made for the safe passage of fish, with very few managing to negotiate the obstacle. 1869 saw salmon numbers above Glasgow at an all time low but poaching was still rife, one chap was caught with 14 fish that he had cleeked from the River Nethan. A Parliamentary report into pollution on the Clyde and its tributaries was commissioned in 1876 and by 1900, although salmon were still running the River Leven in Dumbartonshire, the middle river was virtually devoid of fish. I believe the Clyde River Purification Board was formed in the 1950’s, this, coupled with improved sewage systems meant that the Clyde began to slowly recover. However large industrial complexes such as Ravenscraig were still causing major pollution to the river. A miracle happened in 1983 the first salmon to ascend the Clyde in over 80 years was seen and photographed trying to ascend Blantyre Weir. This photograph was published in the Daily Record under the title “Return of the Kings”. The River Clyde Fisheries Management Trust was the formed and the salmon lease was given to them for a peppercorn rent. Tory influence then took hold of the country, and many large industries found themselves struggling to survive. I remember standing on the bridge at Blantyre Weir in the early 90’s, when an elderly local worthy sidled up to me and said “Aye son you’ve got Maggie Thatcher to thank for your salmon, she’s shut doon awe the industry in Lanarkshire”. Poaching was rife at this location due to the increased numbers of salmon trying to ascend the weir. 1992 saw the formation of the M.C.A.A. Between 1993 and 1994 saw the construction of a small H.E. 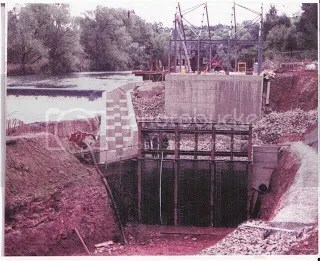 Power Station at the location and because of legislation, a fish pass had to be constructed. This was completed in 1994 and since then salmon numbers have been on the increase in the mid-section of the river. Warranted Bailiffs patrol the river on a voluntary basis and since 1992 one Bailiff has clocked up 104 arrests. Thanks to Jim Delaney for this very informative article.